Let’s start with the peanut butter. In a food processor, add peanut butter, milk and oil. Blend until peanut butter consistence. Add more oil if you see fit. Make sure to scrap the sides and it is blended evenly. 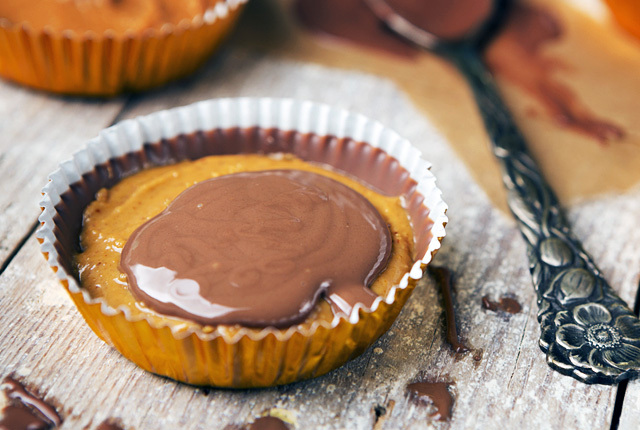 Place mini cupcake liners in mini cup pan. Split chocolate in half. Evenly pour ½ of the mixture into the cups. Freeze for 30 min. Place 1 tsp. of peanut butter mix in each cup, push down a little so its flat. Cover with remainder of chocolate evenly. Freeze for an hour.